Houzz 444 of our visitors have told a friend about this plan. This 2,091-square-foot design, one of our most popular home plans, boasts a traditional exterior. On the interior, a study is situated so you can see arriving clients and welcome them immediately. The kids will appreciate the Jack-and-Jill bath, not found in most house plans. And don’t overlook the stunning master suite! Friends will gravitate toward your home in the summer, to enjoy the lanai and barbecue porch. Floor plans are available for an optional basement, which incorporates a spacious guest suite. Question: Is there a 3 car garage option? Can you give a better description of where the basement stairs will be for option 1? Answer: There is a 3 car version for $150 additional. Option 1 basement stairs are under the main stair. The powder bath goes away and the secondary bath gets a hall door. Question: If this home is built on slab rather than crawl space or basement, where is HVAC equipment located? Answer: In the attic. There’s lots of attic in this plan. Question: what are the flooring types for this house? Answer: Our plan calls for wood floors everywhere except in the bedrooms which are carpet. Tile in the utility and bath areas. Question: If you look at the first floor plan, it shows a powder room with the steps going up for the bonus room. Is the powder room still available in the same spot with the steps going down if I choose basement stair option 1? Answer: No. That option requires the powder bath be eliminated and the secondary bath has a hall entry. Question: The pictures of the actual house appear to be built with mirrored plans because the garage is on the right side. 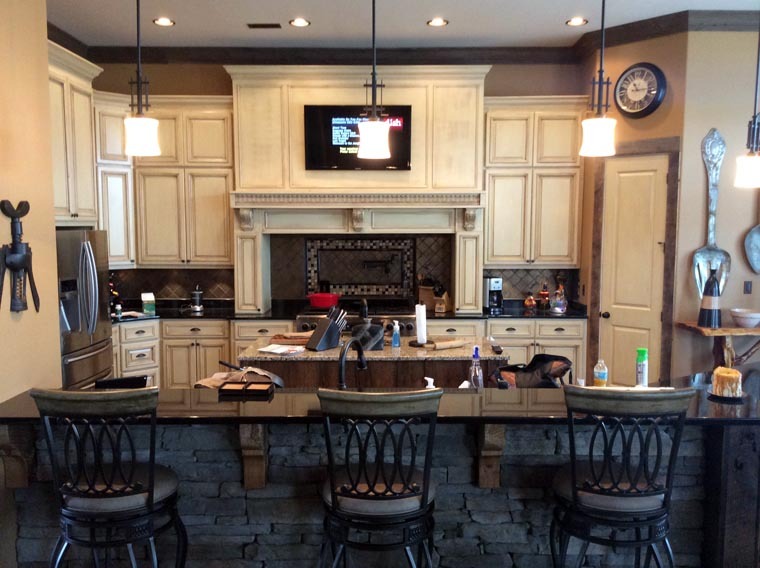 However, the pictures of the kitchen look like it is not mirrored. How is that? I'm trying to figure out how they modified the wall near the stairs to add the additional cabinets that are not shown on the plan. Answer: Keep in mind that many of our customers modify our plans to suit their own personal needs. 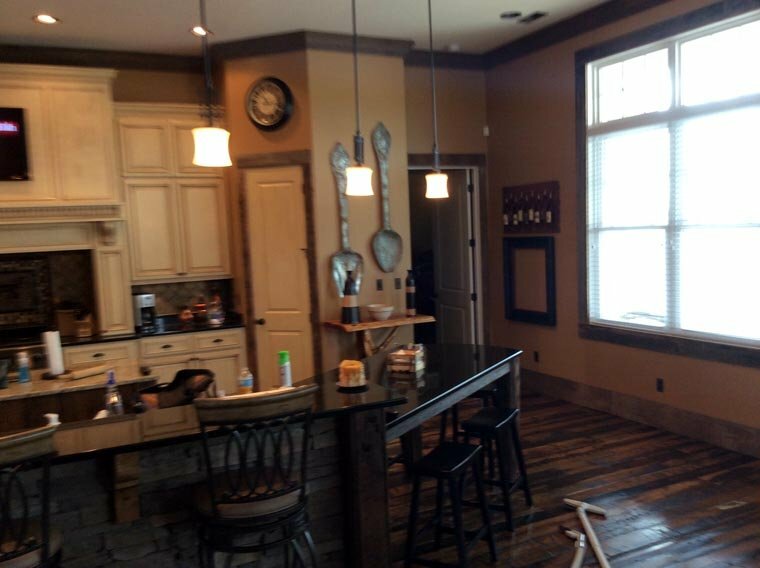 You may also be seeing photos from two different homes. Question: When I choose the 2x6 walls, does the space from the interior, or do you expand the exterior walls? Can I eliminate the step down ceilings in the master bedroom, family room and dining room? Answer: The 2” is taken from the interior. This keeps the square footage the same. It would be easy to eliminate the stepped ceilings in the family and dining. Modification to the master bedroom ceiling would effect the transom windows in the sitting area. Question: Can you tell me what is the width of the house with a third car garage. Question: What is the bonus area square footage for the 3-car garage option? Question: The specifications say the primary roof pitch is 12:12. There are many different pitches. What part of the roof is 12:12 and what is the pitch on the other parts of the roof. Also, is it possible to revise the plan for 9 or 10 foot ceilings throughout? Answer: There is a small portion of the roof on the back which is a 4:12 pitch, everything else is 12:12. The ceilings could be modified to be lower but you will lose transoms and potentially have conflicts with a few other windows/doors. Question: Do you have plans using Nudura ICF foam building block technology? Question: I notice this house says 2091sq ft total living area. That's not including the 549sq ft garage,448sq ft porch, 281sq ft deck or the 349sq ft bonus area, correct? So all said and done this would be total of 3,718sq ft home? That's the number I would be using to get my $ per square ft from my contractor? Answer: There’s no across the board standard for estimating costs by SF. Some builders use heated area, some use total covered area. Question: What is the width of the overhang? Can I take out the fireplace? Answer: Overhangs are 2’-0”. Yes, fireplace can be removed if you wish. Question: I'm interested in knowing the specs on the crawlspace that is included for $200. I'm looking for a 4' crawlspace with outer French drain. Is there any delay on the crawlspace? Answer: Ours is only shown at about 2’, could be easily modified in the field though. We do not show a french drain on our detail for crawlspace, could obviously be added in the field as well. Question: Is there a four bedroom version of this floor plan? 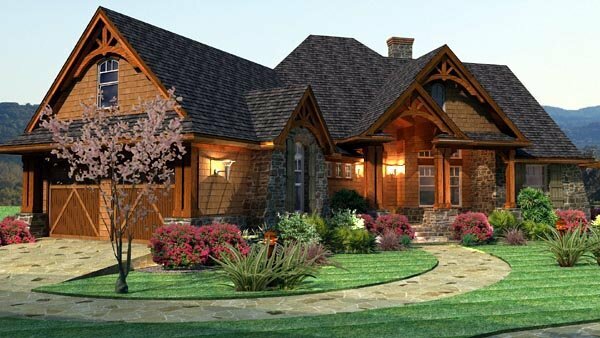 Question: I love the floor plan and elevation of this house. The only thing is I would like to build completely with brick. Would the plan easily adjust to this option? Answer: Yes it would, as there is already a brick ledge all the way around the perimeter of the house. Stone and brick are basically interchangeable, it’s a material selection that must be specified in the field. Question: Thanks. 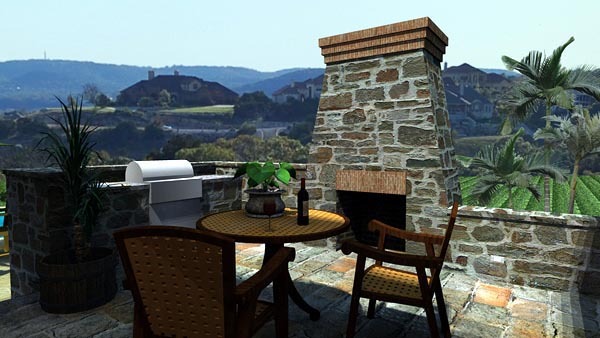 Is that deck a structural deck due to the weight of the stone and grill ? Answer: No. The weight from the upper deck transfers thru the columns and beams. Answer: All the angles are a multiple of 45 degrees. Question: Is there a similar plan that is in between this one and #75134? Question: I was looking at the 3 car option for $150. Not sure if I want to do 2 or 3 car. If that option is ordered, does it come as an 'option', or is the floor plan redrawn where the plans only come with a 3 car? Answer: The 3 car comes as a 3 car only. If you purchase plans in PDF and decide to go back to a 2 car, we can simply swap out the pdf for the 2 car version. Likewise, if you start with the 2 car version we can upgrade you and resend a pdf. There is no refund though for the 3 car of you downsize. Question: On the gable end trim, is that purchased as premanufactured or is that done by the builder? if premanufactured, where would i purchase that? Answer: Custom built by a lumber yard. Question: The master bath shows it 13'2" wide, but the WIC's are 6' wide each. What am I missing to make up the extra 1'2"? What are the dimensions of the bathroom between the two bedrooms? (tub/toilet area and the width of pocket doors and vanity? Thanks! 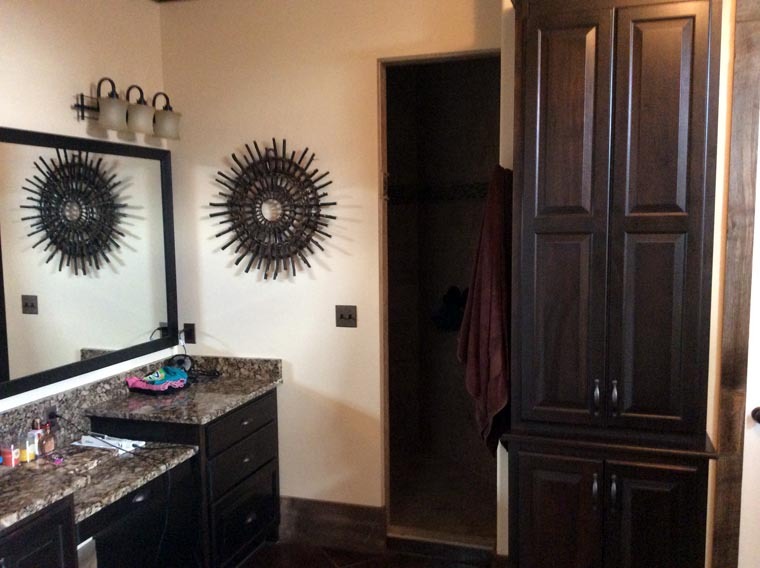 Answer: Well, actually yes, each closet in the master is closer to 6’-6” wide. We probably shortened to 6’ for the sake of saving space in a tight place on the artwork. The dressing area is 5’ wide x 6’-0” deep, the actual bath room is 5’x6’ as well. The pocket doors are 2’-6” each. Question: Looking for a floating slab. What type of slab foundation does this plan have? Answer: Monolithic. Grade beams of approx 30” deep x 10” wide reinf’d w/ 2-#5’s top and bottom. Slab 4 1/2” thk reinf’d w/ #3’s@12” oc each way. Answer: Sherwin-Williams has an online aid called “Chip It” which will identify the colors from a photo you upload. I recommend using images which isolate the material you are wanting identified. Answer: Rough sawn cedar is what we call for. They have to be custom made at your local millwork company. Question: Plan# 65862 has 2091sf and Plan# 65867 has 1848sf. They both have the same dimensions inside why??? Answer: The 1848 SF version does not have a Study. That space is in the garage(non-heated area) as a workshop. Question: What are the dimensions of the master shower, master commode area and the size of the vanities in the master bath. What is the dimensions of the garage if 3 bay garage was ordered? 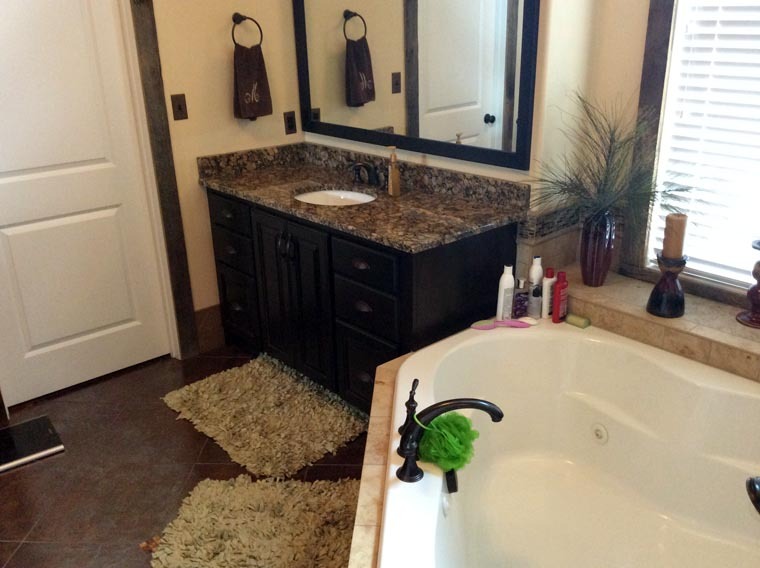 What are the dimensions of the Jack and Jill bath and vanity area? Question: On this plan, is there anyway that stone could be replaced with brick, or is there another plan similar with brick. Answer: Easy to swap for brick. Its basically the same as stone as far as the plans are concerned. 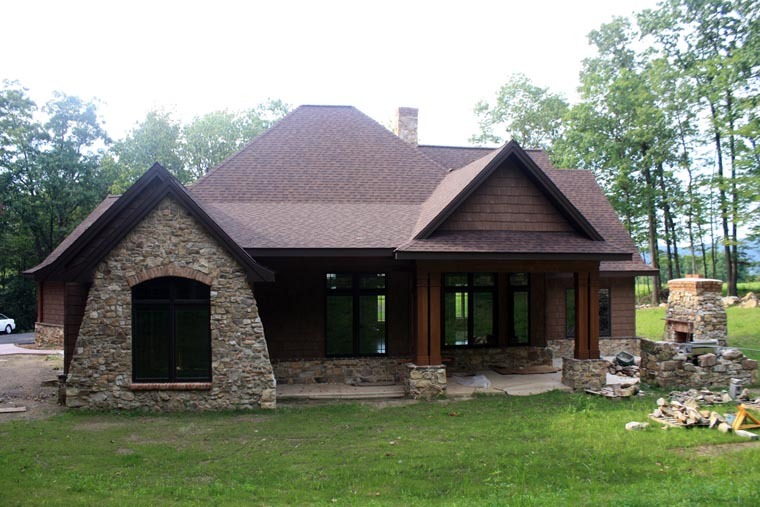 Question: Is the stone for the interior and exterior of this home very expensive? Is faux rock/stone less expensive than genuine rock/stone? 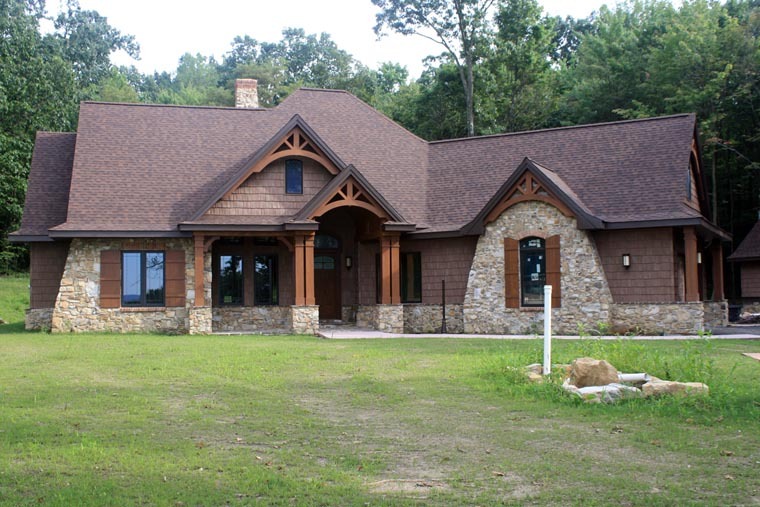 What would you estimate the cost of building this home in southern Alabama? Answer: Cultured stone (faux stone) is a good alternative to real stone if there is no local stone quarried and the cost becomes prohibitive. Question: What size are the roof rafters? Question: So I have what may be a bonehead question! 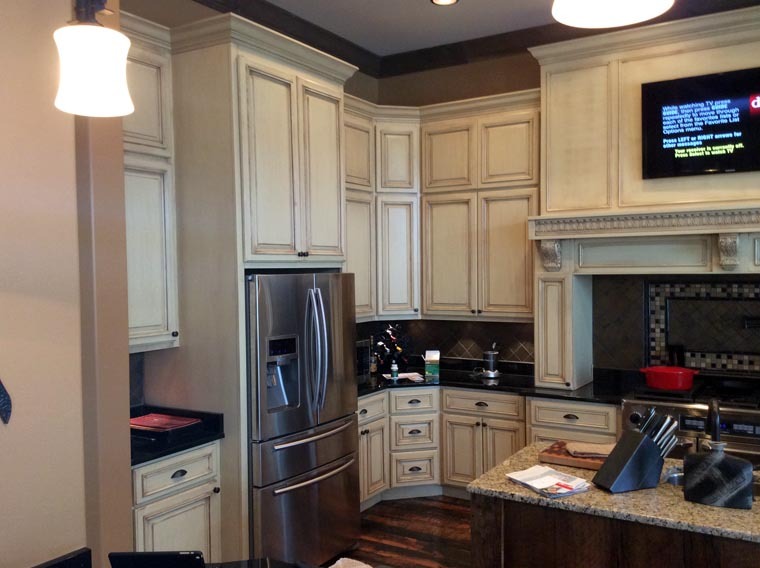 The square footage of kitchen...does the measurement include the floor space that the cabinets take up? In other words, it's measured from actual wall to wall (behind) cabinets, not toe kick to toe kick (front of cabinets), correct? Answer: Yes, measurement is wall to wall. Question: Could you add a 3rd garage space to this plan? If you included a walk out basement, could you add a fireplace/woodstove in the basement? Is there a spec house that we could see? Answer: We have a 3 car version available for an additional $150. 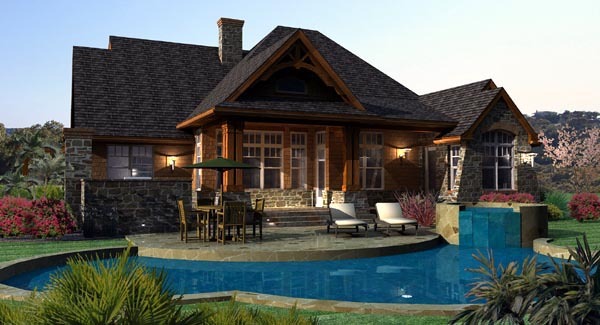 The wood stove could be added, even addresses by your builder easily. Don’t have a model anywhere I could lead you to. Question: What is the ceiling height of the main living area. Plans come standard with slab foundation. Crawlspace and Basement foundations can be purchased as an upgrade option. Plans include electrical schematics(location and type of elect fixture). Circuiting, plumbing pipe size as well as mechanical systems are typically designed by the installing contractor for residential construction. The “battered” walls can be removed, they are not structural. Single set plans come stamped “Not for Construction” and cannot be reproduced. 5-8 sets are intended for construction purposes and pdf/reproducible sets can be modified and/or copied and come with a license to do so. We have no BOM at the present time for this plan. Question: What is the main floor & bonus room ceiling height? Answer: 1st floor varies between 10’ and 12’ with some steps higher in the Family. Bonus is 9’. 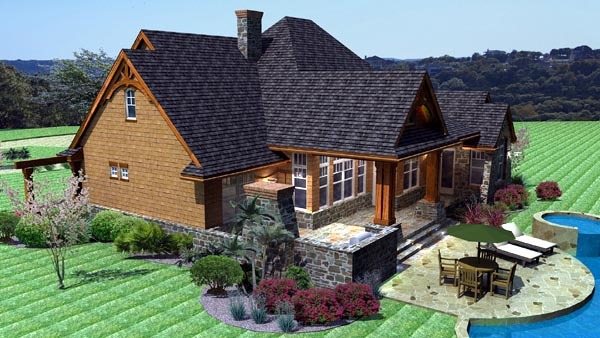 Question: If I purchase the plans, will the material needed be or the type of tile, wood, brick, etc be included? Answer: No. The material specs are up to the client and material quantities need to be calculated by the contractor installing. Question: The Master Bedroom, the measurements...do those include the sitting space? Can you break the measurements out for me on each of those spaces? Is the sitting space more like an oversized window seat or an area you can actually walk in? Answer: It is actual floor space. The sitting area is included in the room dimensions and the offset is 4’-0” deep, which leaves about 13’ for a bed wall. 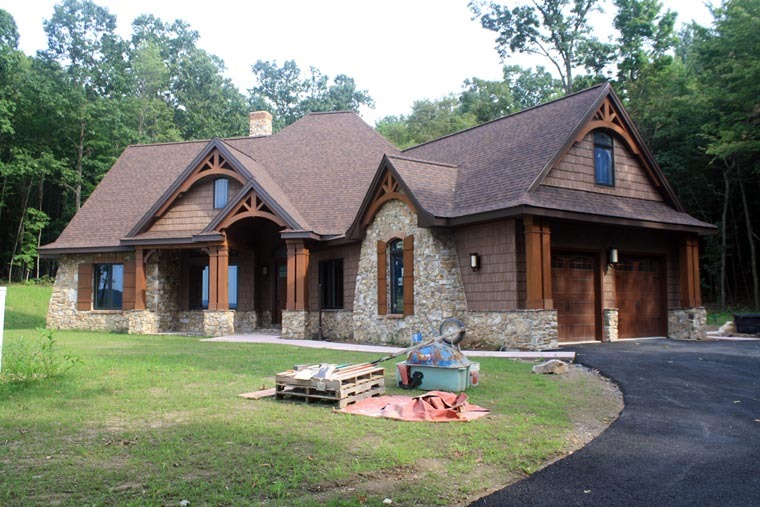 Question: what do you believe the cost to build this home in the missouri state? Answer: I’d figure between $125 and $150/SF. Question: If 2x6 option is ordered, what is the turnaround time? Answer: It would ship out within 1 business day of order. Answer: The plans are not sealed with a Florida State architects seal. A local architect/engineer may be required to permit. Check with your jurisdiction. We do not provide materials lists. These are more accurate when calculated by the company doing the work. We currently have no photos or testimonials, but might soon. Question: What is the height of the walls? Answer: 9’ plates on either end and it steps up to 12’ in the center. Answer: Basement square footage is the same as the first level or 2091 sf. Question: I was wondering something about this plan. I see that the square footage is 2091. well Is that counting the garage? If so what is the total square footage of a/c space on this plan. Answer: 2091 SF does not include the Garage(549 SF) or the Porches(192[front]+256[back] SF) or the Bonus Area(349 SF) above the garage. Question: Is the fireplace a woodburning fireplace or gas? Answer: 59'-6" without the Garage. Front door is oversized - 4'x9' tall. We call for a steel/glass door with wrought iron grill/scroll work. This is an expensive door but is very impressive - probably $4-5k. We call for cedar shake siding. Hardi-board makes a product which is very durable. Question: I was looking for a different answer below. The 2091 sq ft is a little larger than I was looking for, then I found the 1848 sq ft home of the same design. How can they have the same footprint with a 243 sq ft difference? Customer's Old Question: Good Morning Could you please clarify: Plan # 65862 is 2091 Ft2 @ 76’-9”x 71’-5” while Plan # 65867 is 1848 Ft2 @ 78’-9”x 71’-5” Thanks Mark Designer's Old Answer: The 76'-9" must be a typo, they are both 78'-9" wide. Answer: The blacked out areas are dead space behind walls. The window above the entry is in the attic. We do not presently have any pictures of this plan. The stone is aesthetic only. It could be modified and is non-structural. I am counting about 24 LF of base cabinet and 13 LF of upper cabinet. Answer: other than the one in the hall by the bedrooms, no. Question: Hello, Love the home. We are building on our 27 acres in 2012. 1. Is the bonus area above the garage...room in attic trusses? 2. Where would the stairs go to the basement on the floorplan? Thanks. Question: What is the square footage of the basement and is it excavated? Can the basement layout and square footage be redesigned? Answer: We show 1524 sf of finished basement.. That can be modified. Question: Can you tell me the total sq. ft. under roof for this plan for a slab foundation and not including the bonus room and BBQ porch? Thanks Can you tell me the ceilling heights for the Kitchen, Family room, Dinning Room and Master Bedroom? Answer: 3235 SF (slab - not including bbq porch) Kitchen, Family, Dining = 12' clg Master = 10' stepped to 11'-0"
Question: What is the siding material & what type of maintenance is required for it? Answer: We are calling it 'rough sawn cedar shakes' on the plans, but Hardi makes a similar product that is low maintenance.. Question: Does the kitchen, master bedroom, and living room have trey ceilings if plan is ordered as is without modifications? Thank You! Answer: The Family, Dining and Master all have "step ceilings" which is actually a bit more in line with trends than a tray ceiling.. but ceiling treatments are something that are very easy to work out with your builder. Question: Does slab foundation show footers and bearing walls exist? Does the slab plan also show heating ducts and plumbing locations in measurements? Answer: It shows footings but not heating ducts or plumbing. Question: We are not interested in having a basement. Is there any attic storage or storage in the garage? 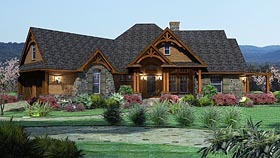 Answer: We show a Bonus Rm over the Garage and there would be access to a lot more storage in the attic. If the Garage is where you want storage it would be easy to add a few feet in depth to the Garage to accommodate this space. Question: In the bonus room, how much of the 12' 9' is between the 9' ceiling lines? Answer: The actual portion (in width) that is a 9' clg, is 5'-4" wide. The clg ht at the entire 12'-9" width is 5'-0". It is a 12:12 clg slope so for every foot you decrease that 12'-9" width, you get another foot of clg ht. Keep in mind this something that can be manipulated in the field with your builder. There are a number of good solutions to increase the ceiling height in the Bonus. For instance you could drop the floor of the Garage a foot or two and bring the ceiling/floor above down with it and not substantially change the look/proportions of the elevation. That's one idea anyway..
Answer: The stone is just a darker color than you may be used to seeing with a high contrast mortar. Its just a semi coursed, roughly rectangular stone. The rendering also shows mortar joint that is pretty much flush with the stone vs. what you might normally see with a deep raked joint. The siding material is just a cedar shake. 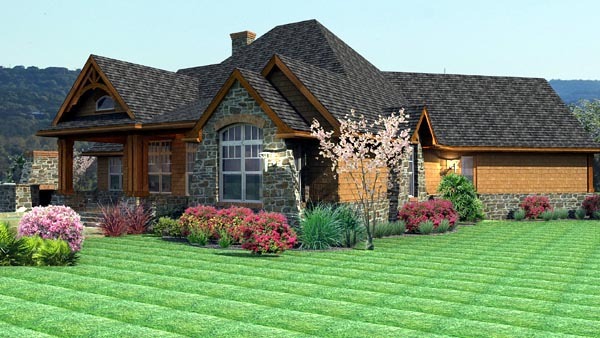 I believe Hardi-Board makes a product like this now as well, but there are plenty of manufacturers who make it in sheets vs individual shakes/shingles.. but you can go with a fully authentic look of individual shakes as well. My preference would be something in a sheet that can be stained. Hope this helps. Click Here to download a free PDF Brouchure of Plan Number 65862.